How much will it cost to light my new build? ask self-build owners. How do I budget for my lighting? There’s not an easy answer to this but you, as the instigator of the project, probably hold more answers than you know. Here are a few personal observations from my years as a lighting designer. The design of your building will determine how much natural light you can take advantage of – position and size of the windows and surrounding landscaping will have a strong impact on the interior illumination. The more you can benefit from natural light, the fewer light fittings you will need to purchase and the lower will be the running costs so it’s worth bearing this element in mind during the initial planning phase. There are two elements to bear in mind – the cost of a) purchasing the products and b) installing them and then there’s the price of running them over the years. 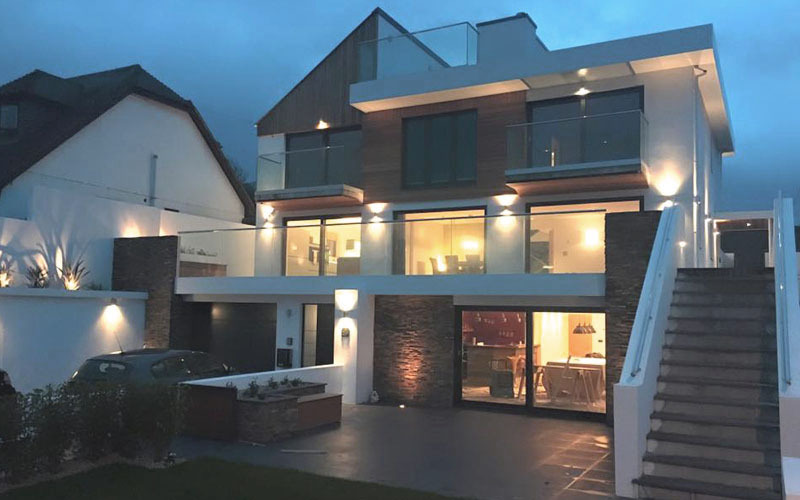 Incorporating a home automation system can be quite a hefty outlay initially but there are economical features that can be integrated and an installer will be able to arm you with the figures to help you make an informed decision. If you are looking for a high end finish throughout the building the quality of the integral fittings should be in line with the standard of building materials and other fitments. I’ve seen projects let down at the eleventh hour by clients saving (the tiniest proportion of the complete build cost) by using plastic light switches or cheaper LEDs giving out glary cold light. And I’ve even had a client who presumed the cost of lighting the entire house would be equivalent to the price he was paying for a rather luxurious bath tub. As the saying goes “Don’t spoil the ship for a ha’p’orth of tar”. I’ve had clients who say they like subdued light and want to hold back on the number of fittings. Whilst I am a great advocate of mood and ambient lighting an allowance for greater task lighting should always be borne in mind, especially as over the years we will need more light with our aging eyes. No one wants the hassle of adding more lighting once the build has been completed and whilst lamps can help add illumination to living rooms and bedrooms it’s not so easy in bathrooms and kitchens where more task lighting is needed. In short I’m afraid there is no easy answer but as a lighting designer I like to know more about the style and quality envisaged for the project and will propose the best, most cost-effective solution for the scheme in hand always bearing in mind quality and longevity.